And here I am in Jemez Springs at 1:15 in the morning babysitting my granddaughter. This is quite an accomplishment for me. I haven't stayed up this late in a long time. We all went to the saloon for New Year's Eve. There was a cowboy band, dancing, drinks, food and the obligatory hats and streamers. I left after midnight to baby-sit. Can you believe that? It wasn't easy to leave; at least there were exhibits to look forward to. The first one for the new year took place in NYC. Not much to speak of. 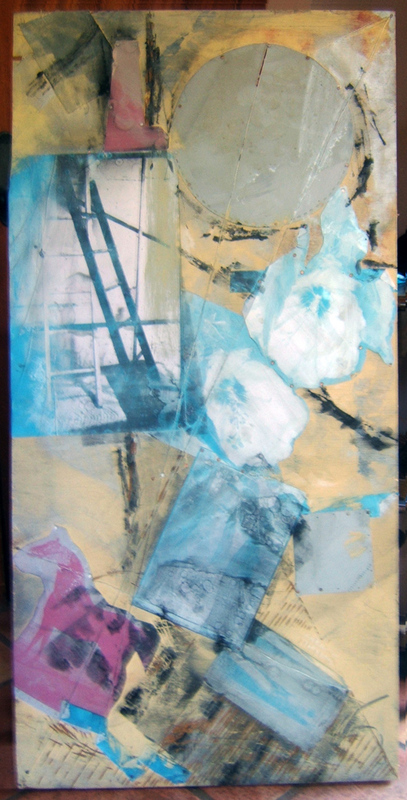 I had completed two series of collages: Placement and LIE. They utilized computer printing and collage techniques that I had been developing for the last two years. 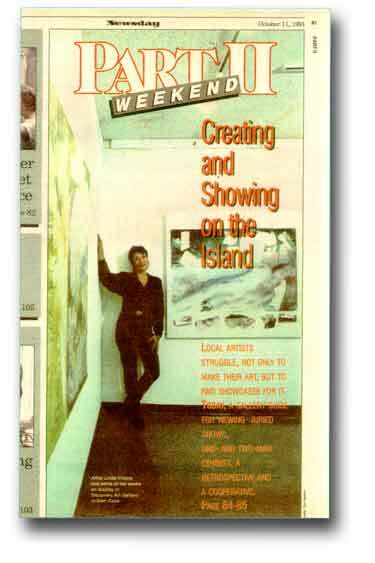 Exhibitions allow me to step back and objectify, necessary for artistic growth and development. February and it's the one person show in Sea Cliff. Brother and friends help me hang; I can't even get to the area without assistance. Three steps! The walls are crumbling, the lighting is terrible and there are broken rods to hang the frames on. We scramble to make it decent for the next day's reception. It's all I can do to keep from being depressed. The company bolsters my sagging morale. Up and down, up and down. The school chums to the rescue again. We plan a lunch together before the reception. Perhaps a mimosa for fragile nerves? Another grand entrance through the back entrance. Accessibility is usually through the kitchen, alley, or in this case a backdoor. A hundred or so people came to the opening. I was glad to see some neighbors and friends from the Village and past. North Adams is a sleepy, depressed town in Massachusetts that retains the flavor of the old sewing mill days. Brick factories and clapboard row houses, five and dimes and an old movie theatre. Stuff artists' love. I arrived at the converted mill - Berkshire Contemporary Artists Center (BCAC, later just CAC) and felt right at home. Eric Rudd and his partners were creating a school for printmaking, painting and sculpture. Thousands of feet of raw factory space, an hydraulic printing press with a flat bed 4' x 8', monastic bedrooms, a health food chef, visiting 'famous' artists and curators, were just a few of the indulgences. All reminded me of those early loft days; the rawness, huge beams, crude flooring, ten foot high windows, thick brick walls, thousands of empty footage. No one cares if paint drips, marble chips or people shriek! I raced up and down stairwells, small prints at the top, large presses on the bottom, and table space for plotting and cutting on the middle floor. 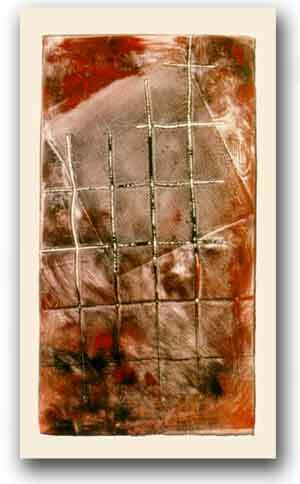 The first plates A-Cross (1991), were made from heat-pressed objects in scrap Plexiglas. Everything was experimental in nature; a real creative high working until 1 a.m. and beginning again at 9 a.m. later that morning. Breakfasts together in a main dining room. Stacy Pearl a terrific chef, photographer and printmaker took all her endeavors seriously. She obliged my request for a photo session of me lying on the floor with the summer's sun hitting my body, naked except for some squares of muslin. The only place to develop film was in town; I didn't think they're appreciate the full body treatment! Dale Bradley, master printmaker, taught us how to burn the photos, manipulate, paste, and ink plates of various sizes and mediums. We used Formica as plates for the oversized prints painting directly on them and pressing into huge dampened sheets. Usually took four people to work the multiple pumps, lay the sheets and printing blankets. Team work was the norm. Painters and sculptors took over other parts of the mill. I'd wander around and think of my own ideas. Couldn't do it all! One trip to a book publisher netted us engraved plates of a variety of subjects. Acquired imagery was so much fun. Rauschenberg taught us that a while back. Back to Glen Cove for work; quickly decided to return for more printmaking. I offered to make a brochure for the school. They had a lot of ideas, photographs and class schedules. It would be used for next year's publicity. This time I brought negatives, photos and various papers to use for the next group of prints. Suddenly became interested in photography as ancillary to the media. Bought a sheet of 4' x 8' plywood at a North Adams lumber yard. Asked them to cut it into four equal parts. They did a terrible job; somewhat off the straight edge. 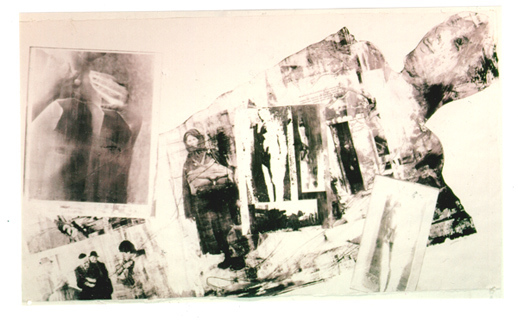 The wood and metal plates, Plate for Print 1 (1991) shown here, are better than the prints. On Long Island a contractor hires me to do all the model making, development plans, flyers and in-house advertising for a South Shore housing project. 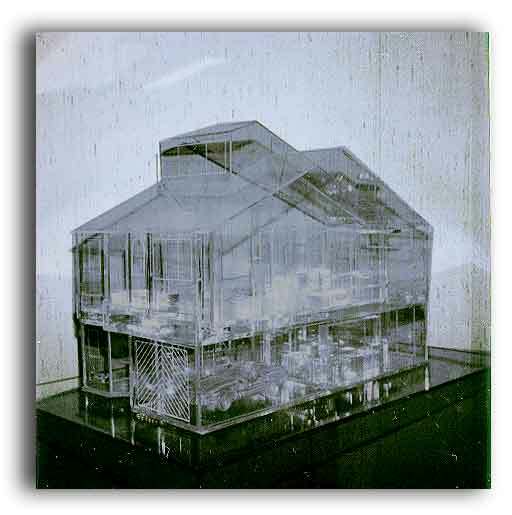 His concept: make a Plexiglas model instead of an actual building, scale model of the projected development and realistic illustration of one section. This would save him the costs of actual construction! Did not know what a nightmare lay ahead. Thank goodness Dad and Dylan came to the rescue. A hired artist did the drawing, Dylan the development model and Dad worked with me on the Plexiglas. Felt nostalgic on a Canal street shopping stint. We even had to put a glass Corvette in the garage! FireStar is a thriving development today. Don't want to think about what I was paid. Took one of the summer's prints and coated it many times over with a de coupage stiffener. 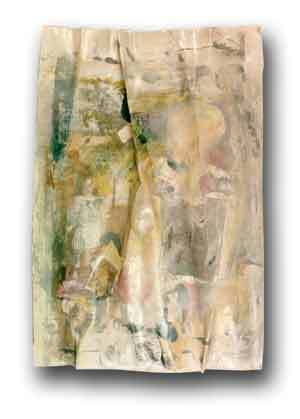 Folded Paper (1991) is reminiscent of earlier assemblage/rag works. On the living room wall it didn't impress me; just seemed pretty and lacking in any real content/message. Once again I tired of making objects for the sake of doing art.